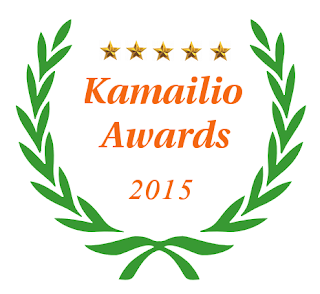 Here we are, the 9th edition of Kamailio Awards granted for the activity related to Kamailio and Real Time Communications during the previous year, respectively 2015. Continuing the tradition, there are two winners for each category. During 2015, Kamailio v4.3 was released and most of the development for upcoming v4.4 was done (to be released on March 30, 2016). The 3rd edition of Kamailio World Conference was organized, gathering the community of developers and enterprises relying on Kamailio and its ecosystem. The 2016 is going to be a reference year in the evolution of the project. It marks 15 years of the development for Kamailio project, maybe not a smooth path always, but with amazing results after all these years. We will celebrate it at the 4th Kamailio World Conference, during May 18-20, 2016, in Berlin, Germany. More of 2016 - after the release of v4.4, the resources will be allocated to design and bring Kamailio to the next level of flexibility and scalability, a project already code-named Kamailio 5.0. To cut it short here, expect an amazing evolution of Kamailio in the near future. Now back to the awards. Next are the categories and the winners! http client modules - http_client and http_async_client - split development between Olle E. Johansson, Hugh Waite, Federico Cabiddu and Camille Oudout - the two modules were developed separately and by that it shows that interactions with external applications via HTTP API are very important for building modern telephony systems. tlsf (two-level segregate fit) memory manager - a core component developed by Camille Oudout (from Libon, Orange, France), bringing in an alternative to the existing memory managers, which relies on a modern management algorithm for memory operations (alloc, free and join) that is more suitable for handling various special cases of SIP server deployments with large number of TLS connections. This contribution "forced" another important enhancement: the addition of the command line option to select the desired memory manager at Kamailio startup. Hugh Waite (Xura, UK) - a long term developer of Kamailio, besides the contributions to HTTP client implementation already mentioned above, he was very active on adding new features or tracking issues to many other modules, such as websocket (adding support for SIP fragmentation), pv, tm, utils, app_lua, json, sdpops, a.s.o. Stefan Mititelu (1&1 Germany) - he had a consistent amount of commits to various components, including support for database management of a RTPEngine farm, enhancements to debugger module to print the new SIP message after the config changes, refactoring of tm statistics, per module memory usage summary, a.s.o. Dragos Vingarzan - the initial author of IMS module in Kamailio (developed via OpenIMSCore), Dragos helped the project to organize many developer and community meetings at FhG Fokus and continue to promote the project via Core Network Dynamics company. Simon Woodhead - a long time player in the VoIP and SMS businesses with Simwood eSMS Ltd, Simon has been a promoter of Kamailio, presenting at various events and publishing articles about interesting topics such as VoIP fraud or building mobile services. Emmanuel Schmidbauer - besides several patches and activity on the mailing lists, Emmanuel was very active on #Kamailio's IRC channel, answering to and guiding the participats to solve their issues in real time. Mikko Lehto - active in Kamailio community for several years, answering on mailing lists, Mikko had also a consistent contribution by compiling Kamailio on different operating systems, pushing patches that cleaned up a lot of specific warnings. Gholamreza Sabery - for publishing the Ansible playbooks and related files for an Active-Passive Kamailio auto-deployment using Pacemaker and Corosync. blog.irontec.com - for publishing an ample tutorial about horizontal scaling of VoIP platforms using Kamailio and Asterisk with Docker (in Spanish, but configs and commands can be taken directly, text can be easily translated with web tools). matrix.org - an admirable effort led by Matthew Hodgson to specify a protocol and build an open source platform to connect heterogeneous RTC systems, with a connector for SIP and Kamailio. Given the trend of big companies to build walled garden RTC services, Matrix is aiming to provide the framework that will make it easier to interconnect, relying on extensible technologies such as WebRTC and HTTP/JSON APIs. sngrep - the swiss army knife of sniffing and analyzing the SIP traffic on a terminal (e.g., when connected via ssh). It can draw diagrams of SIP dialogs (VoIP calls) with updates in real time, it also provides advanced match, search and sort criteria. If you haven't used so far, think of it like a wireshark for SIP traffic in the terminal. IIT RTC Conference - one of the few events out there that still tries to cover a broad range of RTC topics, with a tight relation to research and academic environments, and a particular focus on future needs of communications. TAD Hack - Telecom Application Developer Hackaton - started and mainly organized by Alan Quayle, it is a series of events along year long taking place in different locations across the world, even allowing remote participants. The events try to promote innovation in telecom space by getting together developers of different applications, platforms and services. Developers and friends of Kamailio are often participating, among them Carsten Bock, Federico Cabiddu, Giacomo Vacca, James Body, Randy Resnick. Carol Davids - Professor at Illinois Institute of Technology, Chicago, USA - under her supervision, many students of the Master program at IIT are designing and developing new concepts for RTC using open source applications, involving Kamailio in many cases. Actually IIT has been awarded in the past as an academic entity, due to a number of research papers that were published by their members, where Kamailio has been used during the proceedings. Markus Monka - Head of Infrastructure IT/Telco at sipgate, Germany - an early adopter of SER, continuing with OpenSER and Kamailio, sipgate is known as one of the companies pioneering the VoIP services for residential and business customers, serving several hundred thousands of active connections. Markus has been with the company for more than 10 years, supporting and assisting Kamailio to organize many of its events during the past years. He coordinates the team that contributed many patches and documentations back to the projects. Looking forward to meeting many of you soon in Berlin, during May 18-20, 2016, at the 4th edition of Kamailio World Conference & Exhibition, to celebrate 15 years of development for Kamailio Project. Note: I am solely selecting the winners, with no involvement of Kamailio project members, based on what I observed and has risen my interest during 2015. Also, a rule that I try to enforce is that a winner of a category in the past will not be awarded again same category (a winner one time is a winner for ever).